When our family gets together you can be certain beef is on the menu. Beef was nearly a food group of its’ own when our kids were growing up since it was such a big part of their diet. Raising healthy kids was important to my husband and I so it pleases me to know how many nutrients they were getting with each savory bite. Getting kids to eat beef was easy while getting them to eat a variety of vegetables was a bit more challenging. Steve’s “Broccoli and Beef” recipe in his hand-hammered wok was one of our family favorites. 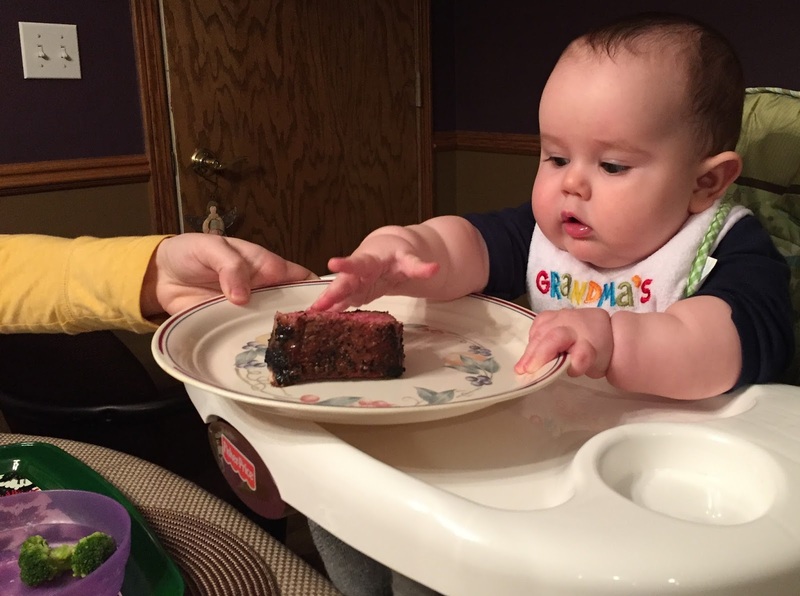 Our grandson reaches for a piece of steak as his bowl with broccoli sits nearby. When our children were starting to eat solid food one of the first things they were exposed to were very small pieces of hamburger. Their tiny little fingers wanted to master the art of bringing food to the mouth. We found hamburger to be an easy, healthy item for them to try. Steve would often refer to their hands as little grapple forks trying to grasp at food and bring it up to a wide-open mouth. We knew the beef was giving them ZIP-zinc, iron and protein-but we didn’t realize those little pieces of beef were putting important nutrients into their bodies like B12, Selenium, B6 and Phosphorus. It’s important to me to have research showing the benefits of beef in the diet. Many studies since the 1970’s have encouraged a diet lower in red meat. When I was taking aerobic dance classes in the 1980’s I heard fitness experts promoting diets low in red meat. Moving on into the 1990’s I saw firsthand the health benefits of a diet including red meat. Our children were rarely sick, they did very well in school and we all maintained very busy schedules. As a beef producer I am very proud of the research our own checkoff dollars have done to show how beef can be part of a healthy diet. If you would like to see for yourself the benefits of beef in your diet you can take the 30 day protein challenge found here. 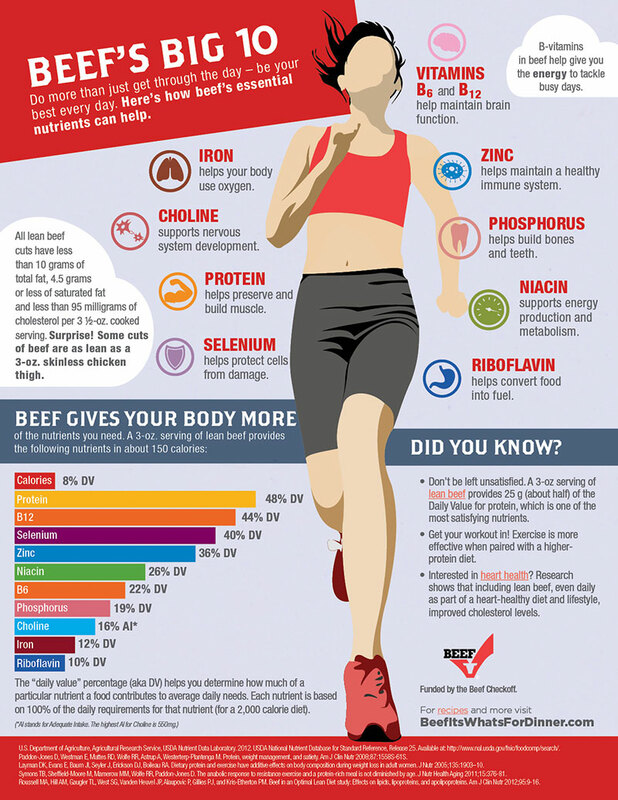 How many reasons do you need to make sure beef is part of your healthy diet? Beef is good for your muscles, your immune system, your nervous system, your bones and teeth, your blood, and your brains. Not only does beef fuel your brain with vitamins B6 and B12 there is also an article that talks about the importance of meat and human development. The article “Food For Thought: Meat-Based Diet Made Us Smarter” states “As we began to shy away from eating primarily fruit, leaves and nuts and began eating meat, our brains grew.” Anthropologist Leslie Aiello states “Sorry, vegetarians, but eating meat apparently made our ancestors smarter — smart enough to make better tools, which in turn led to other changes”. 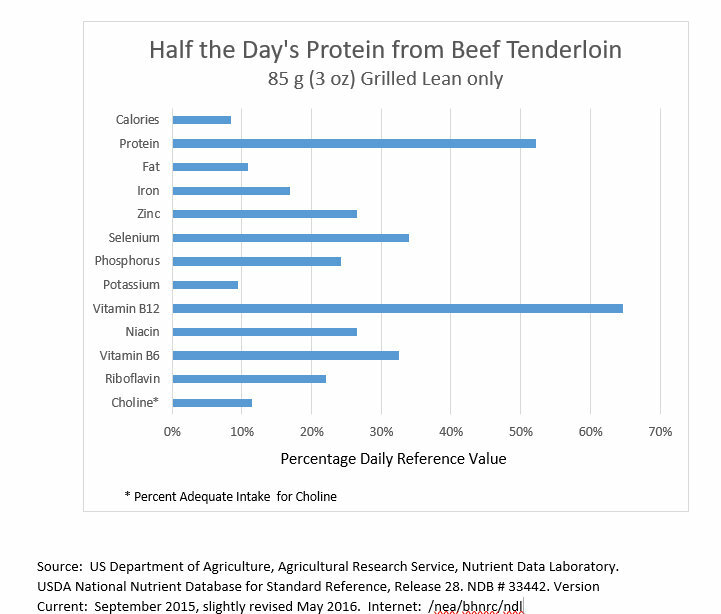 can help you see how beef compares to other sources. Steve and I are part of a community of beef producers that are committed to producing high quality beef for you and your family. We join families around the world that seek ways to raise healthy and successful children. 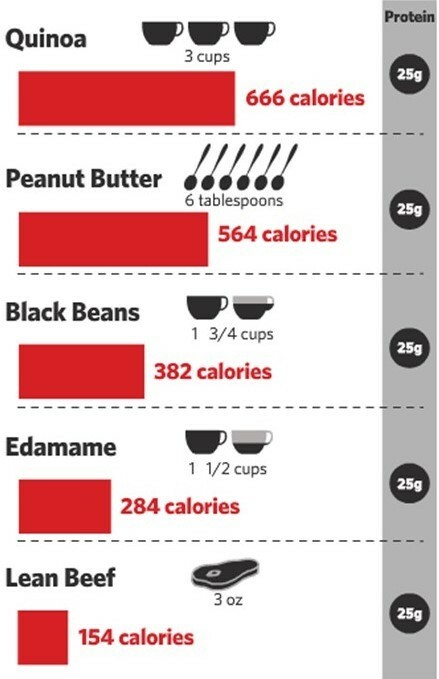 It is very important to note that it only takes 3 ounces to get 25 grams of protein. That size is about the size of a deck of cards! As you seek ways to help your family thrive I encourage you to include beef with plenty of vegetables. Beef and broccoli are just one of many combinations we enjoy and you can find more ideas on the “Beef It’s Whats For Dinner” website. 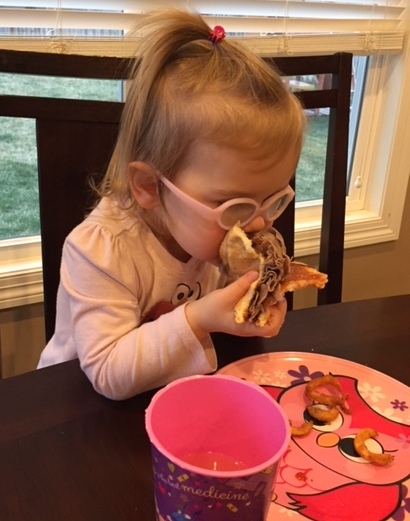 This granddaughter digs in for the better part-the beef! Including beef in diet is very good for young and growing children. As you have mentioned in the post that it fulfills the daily mineral, iron and protein requirements. Do include it in your kids diet. Thank you for you comment! Have a great day!